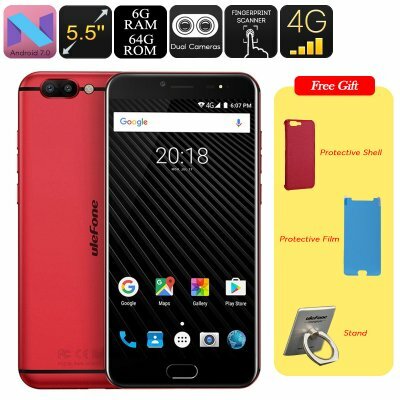 Successfully Added HK Warehouse Ulefone T1 Android Smartphone - Android 7.0, MTK Helio P25 CPU, 6GB RAM, 1080p Display, 16MP Cam, Dual IMEI (Red) to your Shopping Cart. The Ulefone T1 is an affordable yet highly-powerful Android phone that treats you to the latest software and hardware features alike. With the MTK Helio P25 processor in place, this smartphone brings forth an outstanding performance. It furthermore comes packed with a whopping 6GB of RAM. Together, this hardware lets you tackle the most demanding software features without ever dropping a frame. Whether you’re into games, movies, or Apps – there is nothing the Ulefone T1 Android phone won’t handle. Its 3680mAh battery lets you use all your phone’s features for up to 4 hours in a row. With Android 7.0 in place, this cell phone is sure to support the latest Android features available. You’ll be able to undergo a smooth user experience without encountering any lag while taking advantage of Apps and more. The phone treats you to 64GB ROM and a 256GB SD card slot. This provides you with more than enough storage to safely keep your files and media. From now on, you’ll always be able to carry along your games, movies, pictures and more. Dual-IMEI numbers and 4G are in place to provide you with ultimate connectivity. This phone lets you browse the web at lightning speeds and download files in the blink of an eye. All your downloaded media can be enjoyed on the phone’s stunning 5.5-Inch FHD display. Putting forth 1080p resolutions, this Android phone truly treats you to breathtaking visuals. With Play Store support, it provides you with an unlimited access to millions of the latest software features available. With this Android phone in your pocket, you’ll never have to experience boredom again. The Ulefone T1 smartphone comes with a 12 months warranty, brought to you by the leader in electronic devices as well as wholesale Android phones..